A three and a half star read. "What?" 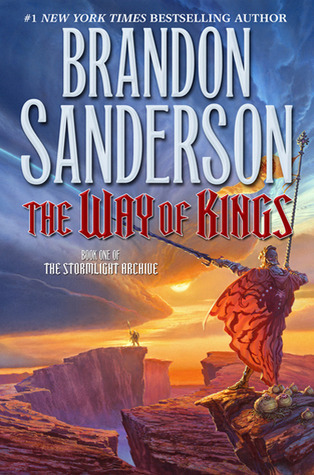 Sanderson's fans say, "this is a classic!" "What?" people who read my reviews say, "you gave the same rating to that mess of a zombie book!" Ignore comments about the length. I've read books that were as long (hello, The Stand, Unabridged), and everyone has read series that were over a thousand pages. What troubles me about The Way of Kings is that I felt like I was reading the fantasy equivalent of a walk through The Field Natural History Museum. Thorough. Detailed. Interesting. And equally devoid of action. Put another way: a saltwater fish tank at the Shedd Aquarium (give me a break; I like visiting Chicago's Museum Mile). Watching the sea anemone wave pink arms as the clownfish darts in and out, chasing little bites of fish food. Again, interesting. But worth six hours of undivided attention? Surely you'd want to take a break and watch shark feeding time, right? Wander off to visit the dolphins and the otters? Narrative shifts primarily between three people; Shallan, a penniless noble who wants to apprentice herself to a scholarly heretic, intending to steal her Souljewel; Kaladin, a former surgeon and talented soldier who now wears a slave brand; and Dalinar, a prince and uncle to the king. I appreciated their different viewpoints; Shallan is a naive young woman, Kaladin a member of the underclass and Dalinar is the king's uncle; from all three, we get a remarkable range of insight into the society. This is a slow, thoughtful book, close to the exact opposite of The Alloy of Law, my only Sanderson book to date. He builds a complete world with varied landscapes and an unique social and spiritual culture. I should have loved it, but what I found is a complete absence of grippingness, that take you by the throat experience. The problem? A lack of dynamic tension. Internal tension comes out of the conflicts each of the three main characters are facing, and their indecision at how to act. Thus, about 700 pages are of them gradually backing themselves into a corner and undergoing a personal crisis. Action picks up around page 800 or so. The last three hundred are the most significant and dynamic of the novel and finally had me turning pages in earnest. (For those who are counting, I know it doesn't add up. There are a few sets of random character narratives that build more background and richness--in other words, add pretty backdrop in the dioramas or the coral reefs). The fans argue that it took the building in the first part to create the dynamic tension of the last, but I'd have to disagree. If it takes 700 pages to get to your main conflicts, are those pages story or indulgence?